Last Sunday was Father’s Day here in Canada. Time to remember my own father and the other men whose genes I have inherited. I can trace the Perkins family line back to John Perkins, son of Joseph Perkins and Ann Mason Sutton. He was born in Withybrook, WAR in 1833 and christened at the Independent Chapel in Stretton under Fosse. This would make the Mason family Non Conformists. He married Clara Benford in 1859 and lived in Claybrooke Magna where they had 2 sons, John Thomas and Walter Joseph. John was the Village Blacksmith as well as serving many public volunteer roles in the village. His son, John Thomas was also a Blacksmith until he left the village in 1910. My Dad, Tertius Bernard Jack Perkins was the only child of John Thomas Perkins and Sarah Jane Sleath. They were married at St. Peter’s in 1901 and he was born in 1904. In 1913, at the age of 9, he emigrated to Canada with his parents. Joseph Perkins remains something of a brick wall. I believe him to be the son of Thomas and Dorothy Perkins and christened at Sharnford,LEI in 1795. He is listed as a Butcher on John and Clara’s Marriage Certificate. The other men, John and John Thomas were Blacksmiths and my Dad was a Telecommunications Technician with the CPR (Canadian Pacific Railway). If I look at naming patterns, I see the name JOHN carried down. Since John named his second son, Walter Joseph, the Joseph after his father, could I be correct in that he named his first son John Thomas after himself and his grandfather THOMAS? Someday……I may discover the elusive record which will prove me correct. How long had this family been on the land in |Middle England? They seem to have inhabited the border areas of Warwickshire and Leicestershire along what was Watling Street and Fosse Way, the old Roman Roads. Over the centuries, this area had been occupied by the Britons, Romans, Saxons, Danes, and Normans . What stories these people would have to tell…..and if I think I am ENGLISH, perhaps I should take another look or at least, take a DNA test, given the peoples who have emigrated to this land. Weary and Worn in a Wet and Windy London Spring! Just a quick update and I am off exploring on my last full day in London. Can’t remember where I left off with my adventures…think it might have been Tuesday , last day of the Diamond Jubilee Celebrations. A few things I have discovered about London is that the same things are never working properly all the time. This includes the Underground System where they had a water main break that flooded the Stratford Station….this is the Main Access to the Olympic Stadium…..they walked the passengers through the tunnel to above ground, but the Central Line was shut all day. Wonder what would have happened if this had been Opening Ceremonies Day at the Olympics. They are actually quite concerned that this ancient system is not going to hold up with all the thousands that will be riding it over the summer. Then there is the WIFI at High Holborn Dorms…..it has been intermittent since last Saturday. Think everyone took the 4 day Holiday Weekend off and no one could get it fixed. Now everyone is back and it still works only occasionally. Haven’t been able to upload pictures to SkyDrive, but do not think we are having a snooze over here. We are out getting soaked in the never ending rain, with OCCASIONAL sunny breaks. Then of course, there is my competence with all things technical!! Forgot to mention that while I was at the POSH HOTEL, I tried to dry my sweater which was soaked at Battersea Park on the Sunday. It is a combination Washer and Dryer. Guess I had the wash part figured out as my sweater had a 6 hour wash cycle. I kept trying to stop it but things only got worse……I never figured out the drying part as in the morning, my sweater was still WET!!! We saw LION KING and let me say, if you thought the production in Edmonton was good, then “you ain’t seen anything!!! !” This production was absolutely fabulous, sets, costumes, the animals including a huge elephant. Another musical to add to my list that I will see next time I am here. We visited the Docklands Museum on Wednesday out at Canary Wharf. What a change in that area since I saw it in 1992, just after the Reichman Brothers crashed and Canada Tower was left standing there all alone. The museum gives a history on the River and Docks and their importance to the development of London from the beginning of time. We also met Rupert and William, 4 and 6, who were there with their father, an Oxford Professor. He has actually been to the U of A for the Orlando Project..something to do with feminist writers??? Now these 2, I would have taken home in an instant. They were so cute and talkative and their favourite play was Henry 5. Think the dad has a little influence there. Took a train across the river to Greenwich to see the Catty Sark, last of the great Tea Clippers. There we met 5 Fingers. You’ll ask?? He was a young American student on his way home from school in Madrid. He was wearing these shoes that had TOES! They will be in the pictures. Also met a Brazilian women and her husband. Spent an hour chatting with them……she of course was like one of those very classy European women who look marvellous even when the have been out touring all day. Hazel and I met up with Pearl who had been shopping in London for our final dinner. They both laugh at me when I take them somewhere. Bottom line ……I always get them to the destination but sometimes it is a very circuitous route. I say “Well it just over here a ways“, and after backtracking, cross tracking and a final check on a map, we arrive. Pearl is Queen of the Underground. I like staying on the surface and seeing where I am going, sometimes a very long walk coupled with a very long Bus ride. We ate at the PIE SHOP. 2 absolutely charming Italian students were working there and just had to practice their English for Graduated School. Pearl flew home the next morning. Hazel and I are still enduring the WEATHER!!!! Yesterday we took in another concert at St. Martin’s. Hazel had been to the Wesley Museum and I had spent 4 hours at the London Metropolitan archives trying to locate some of her Greaves/Carr ancestors. Today she is off to the British Museum and I am headed to Museum of the Order of St. John and the Museum of London. Supper tonight at THE PIE SHOP. These are English Meat/Chicken Pies with massed potatoes and gravy. YUMMMMMM! So it is “Good Bye to London” and enough memories for a lifetime. We all want to come back soon…..so who knows……maybe more memories. Anyone else wants to come, you are most welcome. If you come with me, you will have to learn about “just down the Road”, “over there a BIT”, “Straight Ahead”, now what the heck is the number of the Bus we want, who has their glasses? Oh it doesn’t stop here, well it’s just a “SHORT WALK”. 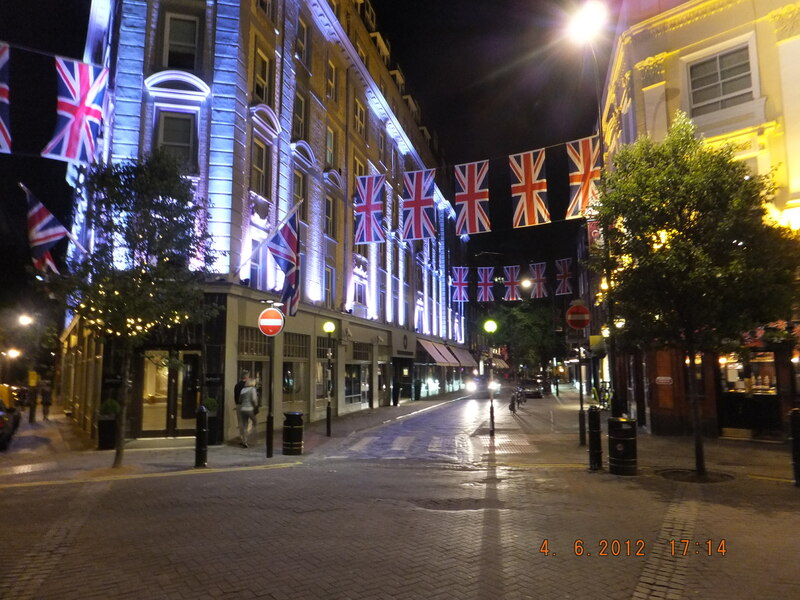 A Party to end all Parties….London’s Diamond Jubilee! What can I say…I have packed in so much over the past 2 days, I don’t know where to begin, actually, the beginning is probably the best place. 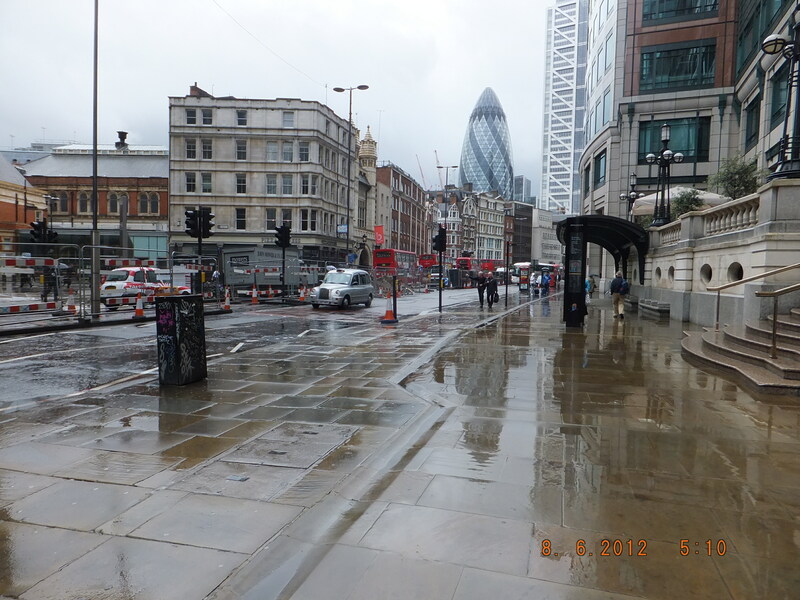 Monday was a somewhat free day after we checked out of Plaza on the River and returned home to LSE High Holborn Dorms. We had no commitments till WAR HORSE at the New London Theatre at 7:30, followed by the BIG CONCERT on the Mall. Decided to walk through areas of East London, so that when I look at a Map, I know where the people I am researching actually live. Got out my handy Bus Map and caught the first bus going in that direction. Met a mother and son on the top deck of the double decker and learned how difficult and expensive it was to buy a flat in London, even the East End. They were going to look at a place for the son who works in London proper. If he bought something, he would have a commute of about 45 minutes to his office. My bus was taking me along Liverpool Street near the Spitalfields Market area, then on to Bethnal Green and Hackney where I got off to explore. Time for a drink break so popped in to a small news agent shop where I could pick up the papers with their coverage of the Thames River Parade. There was an elderly Indian gentleman, better not say that, as we were of a similar age, sitting at the rear of the small establishment. He was friendly and asked why I was getting so many papers. Explained I was visiting from Canada for the Diamond Jubilee. We talked about where we had watched the parade and then progressed to my views on London, the Youth of today and how different they are from our generation. We talked about India and our mutual connection. He was born there. My great uncle, Richard Sleath died there, sometime in the early 1900’s. He fought with the British Army in the Punjab and was discharged in Calcutta where he married an Anglo-Indian woman. I thought about the connections that exist between those born in Commonwealth countries and this weekend in London, it was those ties that brought us together to celebrate the Diamond Jubilee of Our Queen. Time to move on, so I said goodbye. Returned to the City, had a late English Breakfast near the British Museum. Decided as it was only 4:00PM, I should do more exploring. This time it was a bus trip through Whitechapel, Mile End, Stepney Green and ending up near the Olympic Park. As I walked through these areas, I thought about all the people who had also journeyed through here…Eastern Europeans, Jews, Chinese, Germans, Indians, Bangladeshis, Jamaicans and the English who moved into London from the villages. Because this area is near the docks, it was a place of first settlement. Much of this area was bombed in WW2, then huge Housing Estates were built to house the working poor and today much is being torn down to make way for gentrification as well as the completed Olympic Park and the super large Westfield Shopping Centre at Stratford. Went to see WAR HORSE, a story of a boy and a horse who go off to fight. It was so emotional and when you have a front row seat (theatre built like the Maclab Theatre at the Citadel,) to all the war action with gun fire and dead and dying horses and people all around you…sometimes it was hard to breathe. The horses are truly amazing and the goose from the farm a delight. I did a presentation some time back called “Letters from Elsie”. It told the story of my Dad’s cousin, William Perkins from the small village of Claybrooke Magna who went off to WW1 and who died in the trenches in France at the Battle of Cambrai in November 1917. AGE 19! This show definitely hit home and my hanky was sodden by the time the play ended. Good thing I was off to something a little lighter in The Mall. Watched the end of the Big Concert, ( Hazel and Pearl had opted to sell their War Horse tickets, and take in the entire concert) which showcased decades of music with the likes of Sir Paul and Sir Elton and the fireworks. It had been a wonderful day of exploring the East End of London, few tourists bother with it, and then connecting with the World in The Mall…….100,ooo or so! Tuesday was the service at St. Paul’s Cathedral and the carriage ride down The Mall. I saw only glimpses of royalty as there were thousands of people. I did get a good view of some of the 2000 who attended the service by invitation, in their fashionable outfits. By the time I got to Trafalgar Square to watch the carriage parade on the Big Screen, the police had cordoned off the area because of overcrowding. Tried a few back alley routes, but eventually got jammed in a narrow lane with several hundred others all trying to get up close. Never in my life have I seen crowds of this size. After the carriage had passed, the masses tried to move to the Mall. Just about that time the skies opened up for another deluge which was to continue all night. I have a photo of Trafalgar Square and all you see is umbrellas. At 3:30 there was the fly past over Buckingham Palace, the Royal Family appeared on the Balcony and then it was all over. 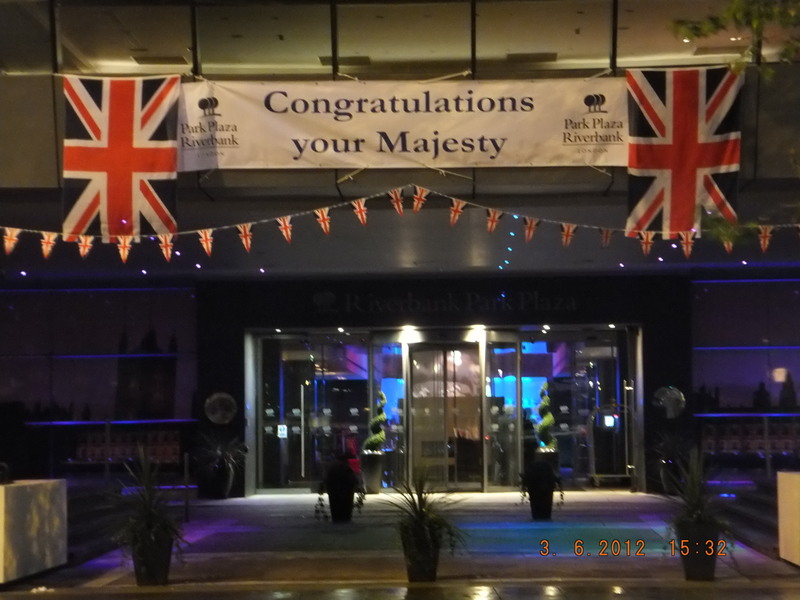 The four days of Diamond Jubilee Celebrations ended as they had begun…… in the rain! It really didn’t matter. It was simply being here, as one of the 1.2 million people who had gathered for a common purpose….to honour a very special woman for her 60 years of service….It was as I had hoped, A Party for the Ages!… A Party to end all Parties….London’s Diamond Jubilee! 60 Loos for a Diamond Jubilee Celebration! Sunday, June 3, 2012 will go down as one of those days you will never forget! I woke in the night to the battering of rain against my hotel window. Got up and looked out to the street below. I could see water forming large puddles. Things weren’t looking good weatherwise, but..well, it could be SNOW! We had decided to start this auspicious day by going to church at St. Paul’s. So as it was still raining lightly when we got up, we hauled out the ponchos and umbrellas and headed out. Pearl was dressed in layers, as she had brought light summer attire. Although people had started lining the river banks, the Tube didn’t seem that busy and when we got to St. Paul’s, there were only a few tourists outside. We attended the 10:15 Service so we could get back across the River and into our hotel. Hazel and Marlene had made their way in from their hotel out near Heathrow Airport and were waiting for us at the front of the church. The journey back was considerably different than the one out. The Tube was jammed. It was so hot and steamy, I thought I would pass out. People were wrapped in Red, White and Blue……hats, scarves and ponchos. Faces were painted with Union Jacks and nails were tri-colored. Almost everyone had a flag. . The Hotel had given all guests wristbands and if you didn’t have one you wouldn’t be getting in. We went up to our room to set out the luncheon. We had food from the Italian Deli….fresh bread, cold meats, olives, pickles, cheese, several types of sweets, tea and coffee, Wine, Gin and Champagne for our toast to the Queen. I had won tickets to Battersea Park where an all day event was scheduled. As the weather was still cold and rainy, my companions decided to stay in the room and watch the parade from the window. I wanted to go to the park to see what was going on. Turned out it was further than I had anticipated, so I hopped a bus and went upstairs where I would have a good view. On the way, I saw the decommissioned Battersea Power Station and the Battersea Home for Cats and Dogs. This was actually the stop I got off at, but NO, I didn’t go in to the shelter or you know what might have happened!!!! The crowds were streaming to the Park Gates where a Security Check was in progress. Now this park is huge, probably something like Stanley Park, with areas for gardens, ponds, a small zoo, trails and I have no idea what else as I didn’t have time to explore. 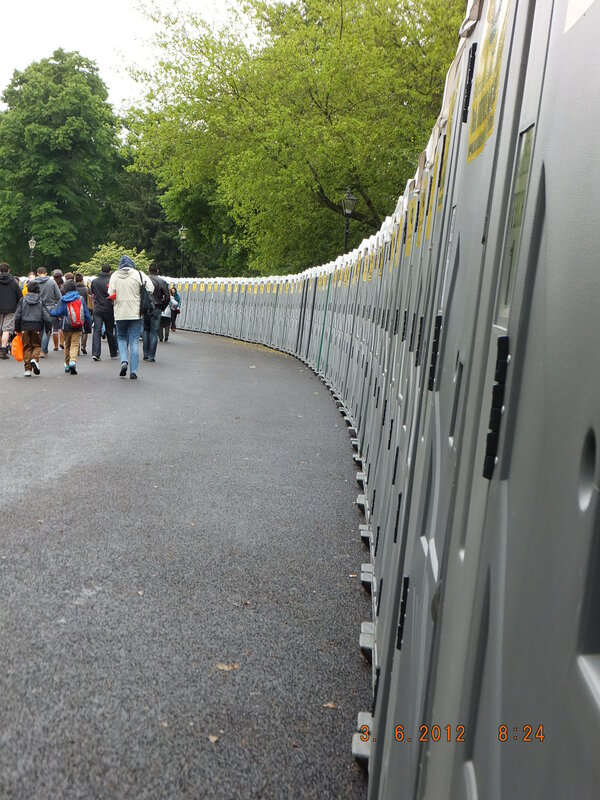 I do know that they were prepared for large crowds and this is the inspiration for my title……60 Loos for a Diamond Jubilee Celebration. They were all lined up on a curve like a piece of Modern ART! Finally made it to the river side of the park where there were hundreds of people, many watching Big Screens which were all over the place. There was a real energy there. People of every age, color and background. The food Vendors had long line-ups, although many people had brought their own picnics. Beer and Wine appeared to be the drinks of choice. I watched till The Spirit of Chartwell with the Queen passed and then I headed across the vast expanse of lawn where they had set up kid’s activities, stages with music from different decades, a huge cake and food area. It was now almost 3:00 and I wanted to get back to the hotel to view some of the pageant and have some of the food. What struck me as I was out and about in the crowds was how happy everyone seemed. Not the usual pushing and shoving you often see at large events. It was a day to celebrate the Queen’s 60 years of service! The skies opened up at I left Vauxall Bus Station and I still has a couple of blocks to walk. Back to the hotel where the party in front was going strong. Up to the room where all were gathered in the viewing room, the BEDROOM, to watch the flotilla. After all the boats had passed, the TV provided us with coverage down at Tower Bridge where the Queen was watching as the boats arrived there. By now, it was a steady downpour, but brave and hearty souls carried on. The only thing that had to be cancelled was the Fly Past. It was almost 6:00PM when Her Majesty finally stepped off The Spirit of Chartwell. 86 years old and SHE had stood for the entire way. As they say…..Brilliant, absolutely Brilliant!!!! A day well celebrated and one for the ages! Moved to Our Posh Digs! I spent the morning at Covent Garden checking out the shops and having Breakfast at Marks and Spencers. Met Pearl at the dorms in the early afternoon and we headed off for Plaza on the River on the South Bank of the Thames. Made a stop at the New London Theatre to get tickets for War Horse on Monday night. They had a few singles left and then the rest of the week was booked. Finally I will get to see play I missed last Fall when Air Canada was going to go on strike and I had to leave London early. Our suite hotel is everything we expected. Kitchen, dining and living room plus a bedroom with king bed and a sofa that makes into a double bed. Coffee and tea supplies provided plus certificates for the Bar for 2 free drinks. We relaxed when we got here and had afternoon tea. Then we went for dinner at a nice Italian Restaurant just down the road. On the way back, we stopped at an Italian Deli and ordered stuff for our lunch tomorrow. Bread, cheese, cold meats, pickles and some sweets, plus wine. There will be six of us here. Room service has been to turn down our beds, so having had a luxurious soak in the tub, I am off to bed. We each have TV’s to watch, so I will nod off watching Inspector Lewis. Tomorrow is a big day and we head off to church at St. Paul’s Cathedral at 9:00. Not sure what traffic will be like. Today was relatively nice and the sun even came out, but tonight the rain has started. Hope it stops by the afternoon. Regardless the flotilla will go on! Could be a Rainy Day for the Jubilee…Preparations underway! Street closures advertised all over, big TV screens being set up in Trafalgar Square and ardent Monarchists are already camped out along the Thames in front of Tate Modern Gallery in anticipation of the Thames River Flotilla on Sunday. The average age of the ladies is likely mid 70’s and they are from England, Scotland and Australia. They said they “wanted a good view!”. Police boats patrol the river and helicopters fly overhead. Six hours of walking, a concert and I am back at the dorm. As I got off the elevator I was greeted by a Drag Queen heading out for the evening. Beautiful blue gown, feathers and diamonds! I felt like a grub in my jeans and T shirt. Today I covered a lot of territory in the north end. Camden Local Studies Library had 2 exhibits..Dickens and the Foundlings! Then on to the London Metropolitan Archives for Memories of earlier Jubilees! Met a women who will part of the street entertainment over the weekend. It is something called “Tea and Sympathy”, so I will be on the lookout for her. In the park across the street from the LMA, The Post Office Museum and The Order of St. John had displays. The young woman from St. John was very talkative when she discovered I was familiar with the organization. Not difficult as they are our First Aiders , as in St. John’s Ambulance. Might check out their museum next week when I have more time. Next up was tea at the Society of Genealogists and a short bus ride to St. Paul’s where I could cross the river to get to the Thames Festival Office to pick up my winning tickets for the Jubilee Celebrations at Battersea Park. A Shandy at a riverside Pub gave me sufficient strength to walk back across the Millenium Bridge and on to Trafalgar Square to get tickets for another concert at St. Martin in the Field. Tonight it is Royal Baroque by Candlelight….. Handel, Bach, and Telemann. There is a fantastic exhibition outside the church titled “ODYSSEY”. 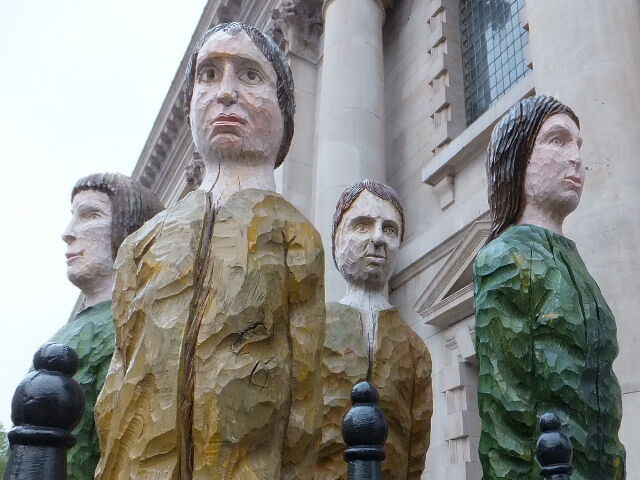 It is 40 Figures of people and began as a spiritual journey on the part of the artist, Robert Koenig, as he followed a route taken by his mother in 1942 from her home village in Poland, through Krakow, the Nazi Slave Labour Camps during WW2 and eventually on to the UK. The monumental wooden figures, carved from lime trees that had their roots, like his mother, in village of Dominikowice. It speaks to the issues of migration, forced or voluntary, and to heritage, belonging and a person’s place in the world. What began as one man’s search for his Polish Roots has taken on a universal dimension. Pearl is out in the county with Lady Doris. No word from her so I assume she is having a grand time. Hazel and Marlene will arrive from the north tomorrow and the weekend will officially begin. Time to put my weary body to rest for a few hours. I need to be in tip top shape to Celebrate! Union Jacks strung everywhere. Store windows decked out with images related to the Queen. I arrived in London yesterday. Cudos to Air Canada for a smooth flight which arrived 20 minutes early! Found my way to High Holborn, LSE Residence just off Shaftsbury in London’s West end. Newly refurbished rooms just made available are the reason I am able to stay in this otherwise very expensive city. The rooms were completed too late for them to be taken by students who are now at the end of term and in the process of writing their exams. Met up with my friend Pearl. She had been out to the House of Lords to have lunch with her new friend Lady Doris and then to check out our ROOM WITH A VIEW, actually a suite in a posh hotel on the Thames River, where we will watch the Thames River Flotilla on Sunday. She wanted to make sure all was kosher and that indeed we did have a reservation!. We headed off to the Diamond Jubilee Proms, A Musical Celebration at St.Martin in the Field, a church just off Trafalgar Square. Everyone seems to be in a party mood. It was a wonderful concert which ended with the audience singing Jerusalem and Land of Hope and Glory and those that had brought their flags, waving them wildly. My body isn’t quite converted to UK time, so it is 5:00AM as I write this. Soon I hope it will decide it is time to sleep. Need at least a couple of hours as there is much to do today. Will be heading off to the London Metropolitan Archives to take in their Jubilee, a Day of Discovery and Sharing Memories. Tea will of course be served! Then I will continue on to the Society of Genealogists, where they will be hosting a Street Party. After that, who knows?